Poinsettia are normally considered a common house plant known for their scarlet red new growth which appears around Christmas time. They do however make excellent subjects for bonsai, poinsettias readily take to hard pruning and bud back with ease, with age their light brown bark becomes deeply furrowed and gives a strong impression of age. 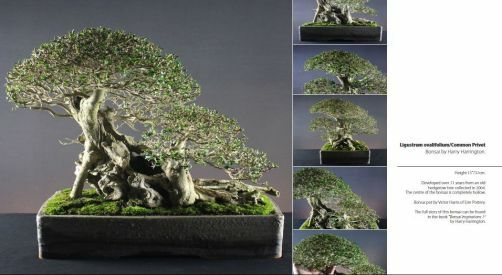 Their leaves are normally quite large (up to 15cm) but reduce well with standard bonsai techniques to around 1/3 normal size. Poinsettias are native to Mexico where they can reach heights of up to 4metres. As well as the familiar poinsettia, there are also a number of varieties of Euphorbia pulcherrima which produce varying new growth colour. POSITION Poinsettias should not be exposed to temperatures lower than 13°C for any length of time and for this reason are commonly grown indoors in most parts of N Europe. Place in full light. During the hottest periods of the summer it is worth moving poinsettias outside as long as night temperatures remain high enough. When outside place in semi-shade. FEEDING When in growth apply a low-nitrogen fertiliser every two weeks. REPOTTING Allow to become pot-bound to help reduce leaf size. Repot every 2-4 years in early Summer. PRUNING Repeatedly prune back new growth throughout the growing season. Hard prune anytime. PROPAGATION Semi-ripe cuttings in Spring or Summer. STYLING Informal upright forms in medium to large sizes. FLOWERING To encourage more prolific flowering during the winter, poinsettia need 12-14 hours of complete darkness daily for 2 months beforehand. During this time watering should be reduced.